Will Your Employees Trust You During Tough Times? 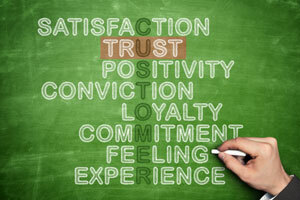 In recent months, trust has surfaced as a key determining factor in employee engagement. For the people who work for you, it's your trust that matters most to them. You're the one having everyday impact on their work life and the trusting relationship you build is not only a requirement for employee engagement, it has to be nurtured constantly and maintained by many small actions over time. Trust is also built by telling the truth even when it is difficult to do. But how can people trust you when you have to deliver bad news, or worse, fire someone? Our research shows that no more than six-in-ten employees feel their senior managers are telling them the truth and providing them with information that is clear and complete. Depending on how you communicate bad news, however, you could turn this into an opportunity to build trust instead of risking or eroding it. 2. Speak up: don’t push bad news under the carpet. When bad news is obvious to everyone, it is wishful thinking to believe it will ‘blow over’. So, when something has gone wrong, address it head on and come up with a plan for communicating it no matter how uncomfortable that might feel. 3. Be accurate, simple, clear, honest and objective; don’t spin stories and don’t try to make a bad thing sound better than it is. 4. Take responsibility; if you made a mistake, apologize and express sincere sentiment. 5. Listen. After you deliver bad news, expect others to be upset. Be willing to listen to their responses. Help them work through what you have told them; don’t just walk away and expect them to deal with it themselves. 6. Say what you will do next; great leaders excel at this point because this is the opportunity to say how they are going to turn a bad situation around. This is precisely what people expect and want from their leaders. 7. Do what you say. You must follow through on what you say, even if the news is bad. If you don’t take the steps needed to address a situation, you will be worse off than if you did nothing. Be prepared to do this many times to demonstrate your commitment to the plan. When you handle bad news in a positive way, it increases your confidence to handle other difficult situations, which also increases people’s confidence in you. When your people believe you, then they can learn to trust you. Trust is essential to healthy relationships, and it is the foundation upon which a healthy organization is built because when there is trust, everything else is easier and more comfortable to achieve. If you want to know what your employees think of you, it might be time to ask them and we would be happy to help get the insights you need.